Located within a short travelling distance of Preston, Manchester and Liverpool and conveniently positioned just seconds from J27 of the M6, our modern and luxury 4 star Lancashire hotel is the perfect venue for your conference or business event. Our dedicated conference venue can accommodate up to 150 delegates in our largest room, with several other spacious and versatile meeting rooms overlooking the beautiful Lancashire countryside. We have recently refurbished our suites to offer modern, professional equipment and excellent facilities. 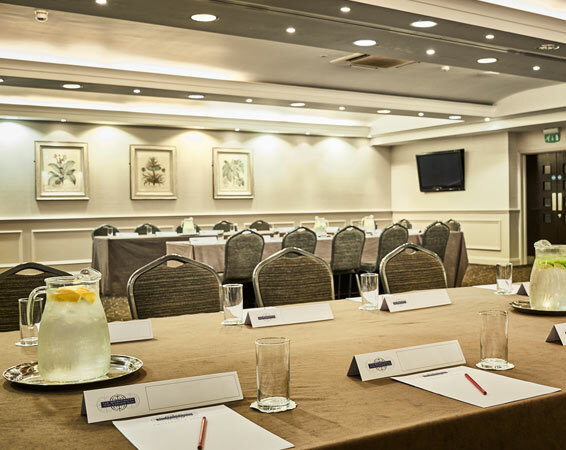 Our rooms are ideally suited to board meetings, seminars, training sessions and presentations, both large and small. For residential meetings, enjoy 24 hour delegate packages & stay overnight in our luxurious rooms. A delicious 3 course meal awaits you after your meeting. Dine in Bennetts or reserve a private dining room. 24 Hour & Superior package day delegates can enjoy full access to the Health Club. Situated close to J27 of the M6. Centrally placed between Manchester, Liverpool & Preston.